We've been talking about the new Dusty Springfield tribute musical "Forever Dusty" for a couple of months now ... and, thanks to co-writers Jon Vankin and Kirsten Holly Smith (who also just happens to play Dusty Springfield in this hot, new Off Broadway Musical), we now have a pair of tickets to give away to one lucky New York Forgotten Hits Reader! The bio-musical has been playing to rave reviews at the New World Stages on West 50th St. in New York City ... and has just been extended through April dates! 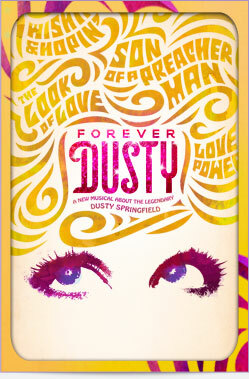 Noted columnist Perez Hilton says ""IF YOU LIKE JERSEY BOYS, THEN YOU WILL LOVE FOREVER DUSTY!" KENT KOTAL / FORGOTTEN HITS: Why Dusty? What was it about her as a singer or a performer that drew you to her in the first place? 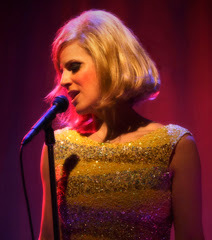 KIRSTEN HOLLY SMITH: My love of Dusty Springfield began when I first listened to Dusty in Memphis and heard that voice, that sound! Where did it come from? I came to believe that I needed to get closer to Dusty, somehow, to channel her spirit by singing her songs and telling her story. FH: Are you first generation Dusty fans? And, if not, at one point did you become enamored with Dusty Springfield? JON VANKIN: If by “first generation” you mean “since 1963,” then no. I have always been a fan of ‘60s music and British Invasion music in particular, so I was always conscious of Dusty Springfield and, of course, I knew “Son of A Preacher Man” and a few of her other big songs. But when Kirsten got me involved with this project, that's when I began to explore Dusty’s career and her life in depth. And there was no looking back! Even now, after all these years, when I listen to her music or watch her on video, I sometimes just catch myself getting lost how supremely great she was – and is. Her voice on even her oldest records sounds as brilliant today as it did in 1963. KHS: I was drawn to Dusty not only by her music, but by what she stood for in her life. She always insisted that she was “not political,” but she never backed down from what she believed. She traveled to apartheid-era South Africa for a series of concerts where she flatly refused to perform for segregated audiences — a direct violation of South Africa’s laws. She took many strong stands at great risk to her career and reputation. She was a powerful woman of powerful convictions whose story deserved to be told. JV: We feel extremely honored that we can tell her story – because our whole purpose is to honor Dusty. She was an extraordinary woman and an extraordinary artist. FH: After watching the Fox News clip, Kirsten, it is quite obvious that you can really belt out these tunes ... what is your background ... and are there any other shows you may have been involved with that our readers might know or recognize? KHS: I have a BFA in musical theatre in musical theatre from the University of Oklahoma. I have a film, TV and theatre background. This is the first major production I’ve done in New York. Before this, I spent most of my time in LA. FH: Had you written anything before? How did this idea come about? KHS: In 2008, I did a one-woman version of Dusty at the Lily Tomlin - Jane Wagner Cultural Arts Center, which is part of the Gay and Lesbian Center in Los Angeles. We got a great response from both the audiences and the critics, which motivated us to build the show into something bigger. New York is the final frontier for theatre in the US, so we set our sites on bringing Dusty to New York. Now, of course, FOREVER DUSTY, is a full “Book Musical” with a cast of five actors and rock and roll band onstage. FH: Was your goal more to pay tribute to Dusty's music ... or to tell her story? KHS: I wanted to honor Dusty both as a person and an artist. That is why we’re doing this show. FH: Jon, how did you come to be involved? Had you worked with Kirsten before? JV: Forever Dusty is the first time I’ve collaborated with Kirsten. This show is very much her vision. FH: Tell us a little bit about your background. JV: I’m a professional writer. I’ve written several nonfiction books, a few graphic novels and comics as well as screenplays and even a little TV. JV: I think I can answer that for both of us. Dusty faced many, many obstacles in her life and career, a lot of them of her own making. We believe that it's essential to give a full picture of her life because without seeing where she came from and the struggles she faced and fought, it's impossible for the audience to fully appreciate what she accomplished in her life, both as an artist and also as a human being. We could have simply zeroed in on one episode of her life, or we could have skimmed over her life entirely and made the show more of a “revue” than a musical play. Certainly, both of those approaches were suggested to us by various people along the way. But we did not want to present just a piece of her. 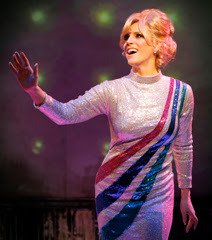 We always wanted our audiences to come out of the show feeling that they know Dusty Springfield as a complete human being, with joys and sorrows, victories and defeats – all of her beauty and all of her flaws. Those are the things that make us all human. By the end of the story, the end of her life, we want to feel that she has really lived. That’s why we took the approach we did. FH: What are some of your favorite Dusty tunes? KHS: She went through so many styles and phases, I have to break it down by time period. In the early ‘60s, “I Only Want to Be With You.” Mid ‘60s, “You Don’t Have to Say You Love Me.” Late ‘60s, “Son of a Preacher Man.” In the ’70, “Crumbs Off The Table.” In the 1980s, “What Have I Done To Deserve This?” or “Soft Core.” I also love her version of “Can I Get a Witness” and her cover of a Baby Washington song called “Doodlin’.” There are so many! JV: Of course I love all of the usual hits ... “Preacher Man,” “I Only Want To be With You”, and so on. But my real love is for some of her lesser known songs. For example, “Crumbs Off The Table,” which is included in the show, or her version of The Five Stairsteps’ “Ooh Child,” which isn’t. I love “Ever Day I Have to Cry,” “Bad Case of the Blues,” “Roll Away,” Don’t Let Me Lose This Dream.” As Kirsten said, there are way too many to list. FH: Kirsten, you've told us the ones you love as a listener and as a fan ... but which ones do you most enjoy performing? What are the ones that really get the crowd going? That get the biggest reaction? KHS: That’s easy. “You Don’t Have to Say You Love Me” and “Son of a Preacher Man.” People know those songs and absolutely love them. FH: I know that you come out and visit with the fans after each performance ... what are some of the things they tell you after seeing the show? What kind of feedback are you getting that allow you and Jon to know that you have squarely hit this on the head? KHS: It’s all very humbling. The feedback is extremely enthusiastic. I’ve had people come to me in tears because they were so moved by Dusty’s story. I get a lot of people thanking me for bringing back great memories and telling me they’ve just relived their childhood, including people who saw her in concert years ago. I’ve had people who actually knew Dusty personally come to the show and tell me afterward that they felt like she came back to life on the stage. It’s very motivational and makes me feel that we’re doing something worthwhile. To be honest, I attribute the great reactions to Dusty more than myself. I feel I am just up there channeling her spirit and we have wonderful, extremely talented actors and musicians who make her life very vivid and powerful. FH: What are the future plans for the show? Do you have any kind of commitment as to how long it will be running? And how do our readers go about getting tickets? JV: As of right now, we have tickets on sale through April 7. Of course we would love to extend past that date, but there are no guarantees. So I would strongly recommend getting tickets asap for dates between now and then. And because we love Forgotten Hits, here’s a special deal: if your readers go to BroadwayOffers.com and enter the code FDFNF2, they can buy tickets at a big discount. As for future plans, we’re working on those and we have a few opportunities in the works that we can't discuss publicly right now. But we are very sure that FOREVER DUSTY will have a long life outside of New York. Let's see ... how should we do this? Do you have a trivia question that you would like to ask in order to help us find a winner? Maybe something that you learned while researching Dusty for the musical? Dusty’s bass player and musical arranger on this track went on to become famous with a VERY famous band of his own. In fact, Dusty helped his band get their first record deal. Can you name the bass player and the band? FH: OK, that's a good one ... let's see what kind of response we get. FH: Thank you both so much for taking the time to do this. I wish there was a way that we could come out and see the show ... MAJOR Dusty fans here! Good luck with an extended run. Meanwhile, what about your future plans? Do you see writing more shows together? Any ideas that you've been kicking around that you can talk about? KHS: Right now, we’re extremely focused on FOREVER DUSTY and figuring out how to keep telling Dusty Springfield’s amazing story to as many people as we can. But yes, we have a few other ideas. Stay tuned! How do you do a full-blown feature on Dusty Springfield like this and then not feature one of her songs??? Here's one of my favorites ... a #22 Hit from 1969 ... and yet another one you just don't get to hear much on the radio anymore. It's "A Brand New Me", a GREAT tune from the "Dusty In Memphis" follow-up LP of the same name. Enjoy! TO ENTER THE FORGOTTEN HITS FREE TICKET GIVE-AWAY: Just send in your trivia answer(s) to forgottenhits@aol.com ... sometime in the next week or two we'll pick a winner from all of the correct entries that we receive. You must be able to attend a performance of "FOREVER DUSTY" in New York City between March 1st and April 7th and we will contact the winner with complete details as to how to get your tickets. And remember ... ALL of our East Coast Forgotten Hits Readers can take advantage of the special discount ticket prices by going online at BroadwayOffers.com and entering the code FDFNF2. And, if you see the show, be sure to drop us a line and let us know what you think!! !